Vlawde, you are definitely sure there's a condition or illness. what do you think is wrong with her?? I am not a doctor. I just play one on the internet. If they go to a Dr. and get a clean bill of health, you'll know for sure, that health problems aren't a contributing factor in what is going on. And how many actually get a "detailed and true" clean bill of health with one visit to a doctor and some tests? Not many unless everything is covered and considered. In other words, I think my house is haunted Doc, give me all the tests to rule out all the signs and symptoms. And then there's the 95% that aren't really going to go out to see a doctor just because members here suggest they do so. Unless Gmorals is fudging the truth big time, we have an over the top haunting that needs to be addressed soon and treated as such. And yes, it's nice to rule out medical and physiological problems. But we still need to deal with what's in front of our faces right at the moment. _If she goes to the Doc, great! _If the Doc and the coverage grant permission for a slew of the necessary tests, Great! Here's what I think... for example, no one posts ghost pics anymore because members find a way to explain every single one of them No Matter What. And now, people are becoming afraid to post about a haunting for fear of being considered loony. At least that's the way the haunted member might take it. I tried not to post much on this particular haunting topic for fear that this would happen... and it did. If she wants to go to the Doctor, that's wonderful... but meanwhile, let's address the elephant in the room... seriously. 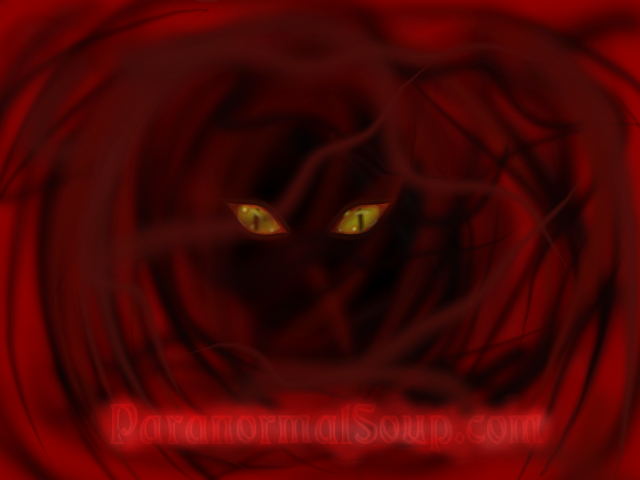 I really don't want to scare members away that have what appears to be a legitimate haunting. I think we should address both possible scenarios but not spend all of our time debating over physical/mental issues. I would ask that we move on now without the debates or I'll sincerely ask Gmorals to start two fresh topics. One for medical issues and a second topic for a haunting. My apologies, Gmorals... I hope all of this didn't scare you away. Thank you Frootloops... this is a good direction. I include her original comments above in the quote. I was wondering if the substance from their mouths was just the sharp teeth or maybe blood too. Are the hands truly long though? Could it be that there are long fingernails or claws? Good point, Frootloops! .........probably long fingernails if not claws! And yeah... probably just teeth. The blood referred to is probably just where directed, to the girls clothes. I'm sure Gmorals can tell us more concerning these points. I feel bad that the kids are involved, they shouldn't have to be worrying about whether the boogey man is going to jump out at them or not, the only things they should worry about is kid things like missing a cartoon, or if they picked the right candy for a treat. Gmorals... I'll PM you tonight with something experimental that may help with the situation in your home. Edited by Captain Kundalini, 02 June 2017 - 07:43 PM. Sorry Gmorals... but this experimental thing is kind of a secret.... so I need to know you are willing to consider it before I send you the information. I also need to know that we haven't scared you away. And to be safe, I would rather send it to your email address if that's okay. Can I get that from you? So i checked some.of the stuff out that you guys have said.All the electrical in the house is brand new and up to code.i had an inspection done just incase of anything and everything is good.i also have brand new carbon monoxide detectors all throughout the house.i had a physical done yesterday just to make sure everything is good and i got some.blood work done as well.the lab called me this morning and verified that my bloodwork came back normal and my doctor said my health is good which I'm happy about.now about an hour ago i was in the kitchen alone and making breakfast when i walked away from the counter i felt what felt like a child tugging the bottom of my shirt and as i kept walking it tugged pretty hard and i screamed.ny husband came running and asked what was going on and i just started crying.this is the first time anything like that has happened.my kitchen is huge and theres nothing around me where i couldve caught my shirt on anything so i immediately freaked out cause i didnt expect that. Sure email me We can access your email address from when you joined, so Jim will contact you I removed your intext email address for your privacy. Edited by KlaineyGStudy, 05 June 2017 - 04:01 AM. Ok, I get it, it's just like a black void and teeth... I kinda visualize them like Nosferatu...Kinda demony vampire-esh. There is a slight delay with the notes I wanted to send you. You should have them by Monday at the latest. I sent you an email explaining. Edited by Gmorals, 04 June 2017 - 04:45 AM. I sent you the notes to the email you have listed in your profile. If you try this ancient method, please let me know the result. Thanks.